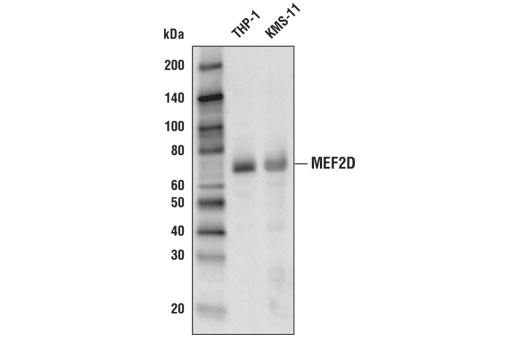 Western blot analysis of extracts from THP-1 and KMS-11 cell lines using MEF2D Antibody. Immunoprecipitation of MEF2D from THP-1 cell extracts. Lane 1 is 10% input, lane 2 is Normal Rabbit IgG #2729, and lane 3 is MEF2D Antibody. Western blot analysis was performed using MEF2D Antibody. Mouse Anti-rabbit IgG (Conformation Specific) (L27A9) mAb (HRP Conjugate) #5127 was used as a secondary antibody. 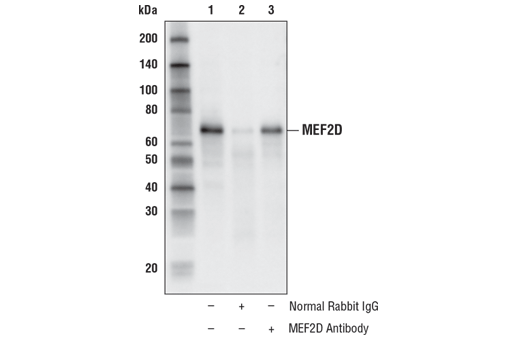 MEF2D Antibody recognizes endogenous levels of total MEF2D protein. Polyclonal antibodies are produced by immunizing animals with a synthetic peptide corresponding to residues surrounding Leu168 of human MEF2D protein. Antibodies are purified by protein A and peptide affinity chromatography. Myocyte enhancer factor 2D (MEF2D) is a member of the MEF2 family of transcription factors. In mammals, there are four MEF2C-related genes (MEF2A, MEF2B, MEF2C, and MEF2D) that encode proteins that exhibit significant amino acid sequence similarity within their DNA binding domains and, to a lesser extent, throughout the rest of the proteins (1). MEF2 proteins contain a highly conserved N-terminal MADS-box domain, an MEF2 domain, and a more highly variable C-terminal transactivation domain (2). The MEF2 family members were originally described as muscle-specific DNA binding proteins that recognize MEF2 motifs found within the promoters of many muscle-specific genes (3,4); however, more recently they have been found to play critical roles in other physiological processes, such as heart formation and nervous system development (5,6). As such, alterations in MEF2 protein levels can result in developmental and neurological disorders, as well as other diseases such as liver fibrosis and many types of cancer (7). Specifically, MEF2D expression in hepatocellular carcinoma (HCC) is associated with higher levels of proliferation and poor prognosis (8). MEF2D is also overexpressed in clinical colorectal cancer tissues, where its high expression correlates with metastatic process. Functional investigations show that MEF2D promotes cancer cell invasion and epithelial-mesenchymal transition (EMT) and that it is essential for certain microenvironment signals to induce EMT and metastasis in vivo (9). Alternatively, MEF2D may function as a tumor suppressor in lipo- and leiomyosarcoma, as decreased MEF2D activity results in increased cell proliferation and anchorage-independent growth (10). MEF2D may also act as a tumor suppressor in rhabdomyosarcoma, as loss of MEF2D expression results in inhibition of differentiation, increased cell proliferation, and increased anchorage-independent growth (11). Chen, X. et al. (2017) Oncotarget 8, 112152-65. Brand, N.J. (1997) Int J Biochem Cell Biol 29, 1467-70. Black, B.L. and Olson, E.N. (1998) Annu Rev Cell Dev Biol 14, 167-96. Shalizi, A.K. and Bonni, A. (2005) Curr Top Dev Biol 69, 239-66. Phan, D. et al. (2005) Development 132, 2669-78. Pon, J.R. and Marra, M.A. (2016) Oncotarget 7, 2297-312. Ma, L. et al. (2014) Cancer Res 74, 1452-62. Su, L. et al. (2016) Cancer Res 76, 5054-67. Di Giorgio, E. et al. (2013) Mol Cell Biol 33, 4473-91. Zhang, M. et al. (2013) Mol Cancer 12, 150.